A Family Tradition for 4 Generations. I am Francisco Bautista, the fourth generation Master Weaver in my family. My wife, Laura, and I were born in Teotitlán del Valle, a Zapotec village in Oaxaca, Mexico. We have always been fascinated by the infinite possibilities of crossing threads. We use only hand-spun, hand dyed wool, and weave each of our works on a foot pedal loom. The vibrant colors you see in our weavings come from our own natural and aniline dyes. Together we work to ensure that the quality achieved by the Master Weavers of old will continue to live on in each piece we weave. As a boy, I remember sitting under my father’s loom as he wove. At first, I began working on the fringes of his weavings, tying the threads one at a time. Then as my passion for weaving grew, he would sit with me at his loom, and show me the rhythm and beauty of weaving. That same passion I felt as a boy I still carry with me ― and I weave it into every piece I make. So, too, my son and daughter have grown up sitting beneath my loom ― and just like me at that age, they are both eager to learn all that my wife and I can teach them about the art of weaving. As they continue to grow, I know that one day Cynthia and David Bautista will be even more skillful than their mother and father. We are proud of the tradition that we uphold together, and thankful for the opportunity to honor and add to that tradition with our work. “I first saw Francisco’s work at an artisan’s market and was immediately struck by the bold, rich colors, the beauty and craftsmanship. I ordered a small rug on the spot. After living with it for a few weeks I ordered another, larger rug for a different room. It too came out beautifully, just as I described it to Francisco. 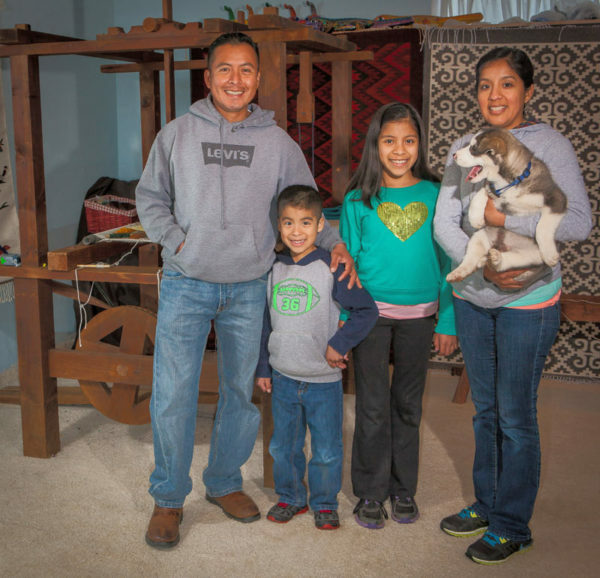 “Laura and Francisco have their heart in their work and their weaving is so beautiful! My rug was woven with a black background with many vibrant colors – many of the dyes from natural sources – in traditional Zapotec design though they can do custom work as well. Our greatest inspiration comes from the exquisite beauty of Zapotec and Navajo art. The intricate geometric patterns of the traditional weaves, rich with symbolism, illustrate our relationship between the natural world, and that which exists beyond ourselves. You will see many of these traditional designs among our works, which we proudly produce with the same time-honored techniques that Master Weavers have used for centuries. Yet even when honoring the ancient ways, we must never forget that weaving is more than a museum piece ― it continues to grow with each generation as a living art, combining tradition with new expressions of color, imagery, and symbolism. Among our collection, you will find designs both old and new, all handmade with the same time-honored techniques that have been passed down through my family for generations. Our weaving studio is located in Sandy, Oregon. We can also weave custom designs for you.